Are you guilty of email “trigger finger”? Do you constantly “cc” people you never even see? What are today’s rules for conducting business over the Internet? 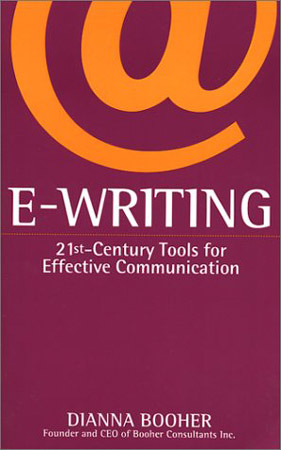 Now, The Elements of Style meets “the Miss Manners of memos” in the ultimate writing guide for the digital age. In an era when written communication in the workplace is more crucial than ever, at a time when many professionals all but completely eschew face-to-face dealings, E-writing is poised to become the new bible of business writing. Accessible and inviting, this Web-savvy “how-to” book promises to transform anxious email hacks and mediocre memo writers into eloquent electronic scribes in no time at all. heighten your professional image, self-confidence, and career prospects. Practicing what she preaches, award-winning communicator and bestselling author Dianna Booher writes in a refreshingly straightforward style and has organized E-writing to make on-the-spot referencing a snap. Keep it handy; refer to it often—and your online mailbox will never be the same again.